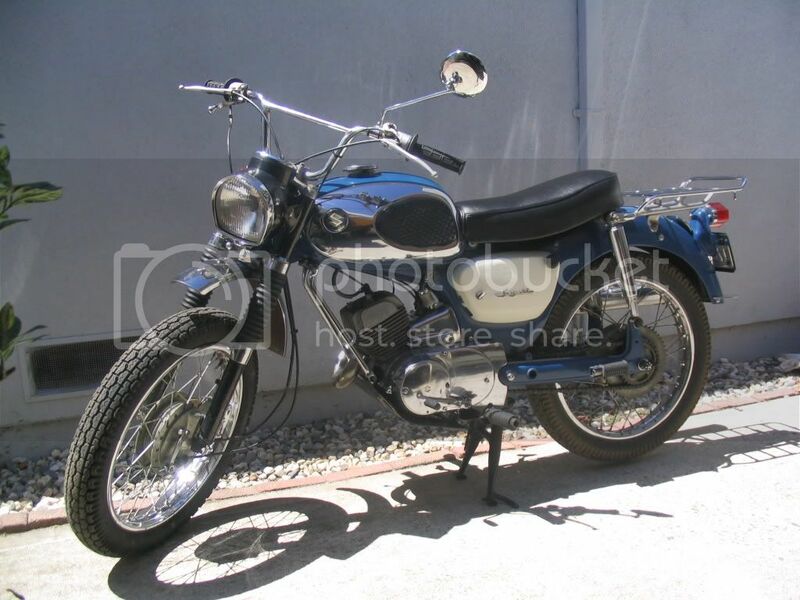 Thread: 67 Suzuki B105P 120cc info? That looks exactly like it, so I'm guessing its a 67, but does anybody know for sure? I'd just like to know the exact year. Also can anybody tell me how the gearing works? The bike has a 4-spd trans, neutral at the top, and four gears going down. On the rear wheel there is 2 sprockets, a large one and a small one, like a mountain bike. How is this meant to be shifted? Is it just meant to loosen the rear end and move the chain to whichever sprocket you want to use, and then adjust the chain tightness? I guess its a cool idea, but kind of a pain in the *** if thats the case. Which rear sprocket would I want to leave it on for speed and street riding? Its currently on the large one. Also, did this thing originally have a battery? I haven't seen a battery box anywhere, or a place for one. There is unterminated leads on the wiring harness, and I know this thing had lights, so I'm assuming they're for the headlight, but did it have turn signals or a brake light? And finally, It has the oil injection system, but it has not been used. The oil line is still running from the oil tank to the engine case. I have been using premix in it so far. I want to start using the oil injection, or "Posi-Force Lubrication" as its called. What kind/weight of oil should I use in it, and how much? If I use the injection do I need to drain all the engine oil in it right now? How much oil does the engine hold, so I can change it if I just keep using premix? Other than that, any information whatsoever is appreciated. The bike is really cool, runs GREAT and shifts perfect. I'm cleaning it up and just gonna use it for a fun little bike in the desert i think. I'm also looking for parts for it if anybody's got anything. front fender, rear fender, headlight & gauges/speedo, front forks, rear shocks, chrome carb cover, rear luggage rack, brake light, turn signals. Thanks so much for the help!!!!!!!!!!!! If I can get some good info about this bike, I'll make a good webpage for all the info for other people who need help with this model. The pictures below should look farmilliar... here are my best answers to most of your questions. Sorry they are a little out of order. I cannot tell you the exact year, as far as I know there is no distinct difference between 1965 and 1967, but I could be wrong. I picked the one in the picture up a few years ago and restored it to the condition you see in the picture. There is a surprising amount of parts available on Ebay and such. They seemed to be popular in England. The vin I used to register mine is the "B100 YYYYY", and the "B100 XXXXX" as th engine number (which DMV also wanted). I hooked up the "Posi-force" Injection and use Redline Synthetic Two-Stroke Oil (because thats what I use in my KX250), but my guess is any modern two-stroke specific oil will be fine. As to how much, just fill up the oil tank, adjust the injector to be wide open when the throttle is wide open, and make sure it never goes empty. The transmission / engine oil is completely separate from the pre-mix / injection oil and I use a heavy weight motorcycle transmission oil. I'm not sure how much oil the engine holds, but there is a viewing window on the side to see when to stop filling. Mine was siliconed over, so I made a makeshift dipstick to put in the filler hole with a mark as close as possible to where the viewing window was. The bike did have a battery which resided behind the plastic cover on the ignition switch side. I do not currently have one either... My headlight and taillight work so so when the bike is running, but blow if I rev the bike too high because of the lack of a battery. As far as I know it never had turn signals. I knew absolutely nothing about this bike when I bought it, but I got it for almost nothing. I love this thing now. I have taken it on several vintage rides and always have a blast when I ride it. Let me know if you have any more questions or need any more info. I'm no expert, but I may be able to help. The B120 B100P B105P KT120, and a few other models are pretty similar, so some parts will interchange, but be careful, I have a few parts that I thought would work and did not. Nice job Red! 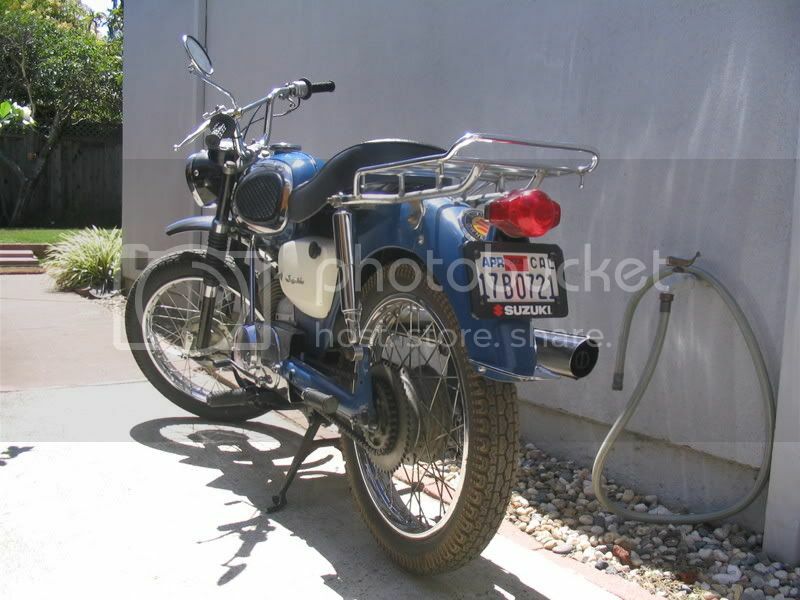 I am in process of doing a 1968 KT120, hopefully for 2008 motogiro USA. What are the tires on yours? Any concerns re crank seals? I'm not sure what you mean by re crank seals, but I am always concearned with the condition of all the seals and gaskets that I have not replaced because after all it is an old bike. all i can say is *WOW*, lovely old bike, i've got a gsx250e which is still pretty cool, but that is fantastic!! Three years, five bikes, and still tickin! I just picked up one of these over the weekend. It has everything, including the original owner's manual and warranty cards (computer punch cards) and an original advert clipped from a magazine. When I get a couple hours, I'll scan in the pages and make a PDF out of them, but if you have any questions that the owner's manual might address, feel free to shoot them my way. Also, anyone know of a haynes manual for this bike. I can only find the B100P manual and I have to pull apart the crank case to reseal it...but I'm kind of new to this. I've just inherited one of these. Pretty sure it is a 67 as well. Sadly it is in pieces. Going to spend the week trying to figure out which way is up before I decide whether the project is worth it/achievable. I have NO motorcycle experience (but I've worked in auto shops in the past). I'm also interested in any leads for repair manuals. If only I can get this one to look and act like the ones above! Here is result of my KT120 restored and set up for the Motogiro USA. There are parts out there for restore, but they are not cheap. I have 1965 and some parts I can not find it. If you have an extra left frame cover (the plastic piece at the ignition key) I will buy it from you. I have just completed my B100P project. I have a few original old parts from the bike for sale. Please lets me know if anyone is keen. Attached is pictures how the bike looks like currently. was wondering if you ever made the pdf of your bearcat owners manual... would love a copy as i just bought a bearcat of my own... i love it! I have an original suede seat for your Bearcat. That is what came on those bikes in the 60's. Give me a quote and we'll see what we can do. Dave, do you happen to still have the B105's?